When I asked around about what people’s favourite meatballs were, these grape jelly meatballs kept showing up and I knew that I had to try them out! Well, I have a new favourite meatball recipe now! Knowing me, I had to go investigate what they were, because believe it or not, this child of the 1970’s hasn’t ever eaten them! They obviously weren’t in my Mom’s repertoire when I was growing up. I learned that when it comes to an easy recipe this is it! When you are in a hurry for supper and need something fast this sauce is a easy option. Three ingredients: mix it, and warm it and pour it over the meatballs. This is also an easy appetizer for a party! The Grape jelly gives the sauce the sweetness and the ketchup gives it a hint of sour. A perfect combination! Put the jelly, ketchup and Worcestershire sauce in a small pot on medium heat. Whisk all the sauce ingredients together until smooth. Warm the sauce to just a simmer and pour over the meatballs. Bake in the oven until the meatballs are cooked. These have become a new favourite, that’s for sure. I can’t get over how good the sauce is and it’s totally because of that grape jelly.I can’t believe how much I liked these meatballs and I’m sad that I haven’t been making them all of these years. While they aren’t the type of recipe that I will use in a cookbook they are absolutely perfect to share with you guys! Try making these with my Homemade Meatballs recipe. To make your cooking life super easy you can use your favourite pre-made meatballs, either homemade or from the store. You can use frozen store bought ones when you are in a hurry and these meatballs will still be delicious. Use your favourite brands of jelly, don’t cheap out just because you are putting the jell on meatballs. Remember, what you use as ingredients always matters, just like using a cheap wine can ruin a dish. Want to be crazy? Add a splash of hot sauce to this recipe to take it over the top! The spicy and sweet combination is out of this world. 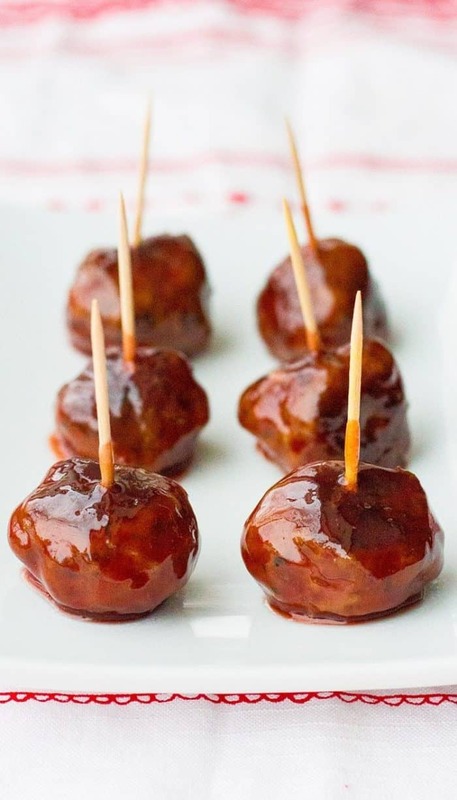 Eat these grape jelly meatballs as an appetizer or your main meal with rice. 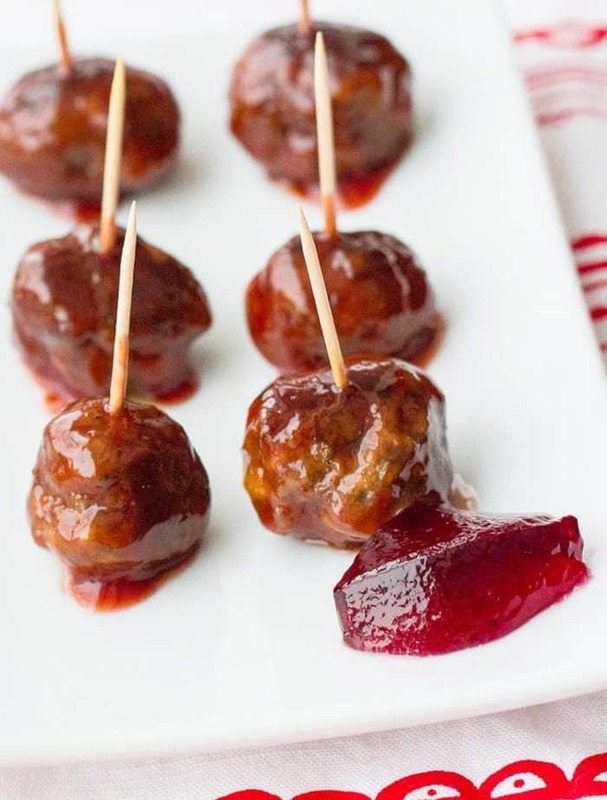 So when’s the last time you ate grape jelly meatballs? I feel like I need to have a retro party and serve this! If you are looking for another good meatball recipe that is easy, my Crockpot Meatball Shepherd’s Pie is AMAZING! Pin this recipe to your Appetizers or Supper Ideas Board and Remember to FOLLOW ME ON PINTEREST! 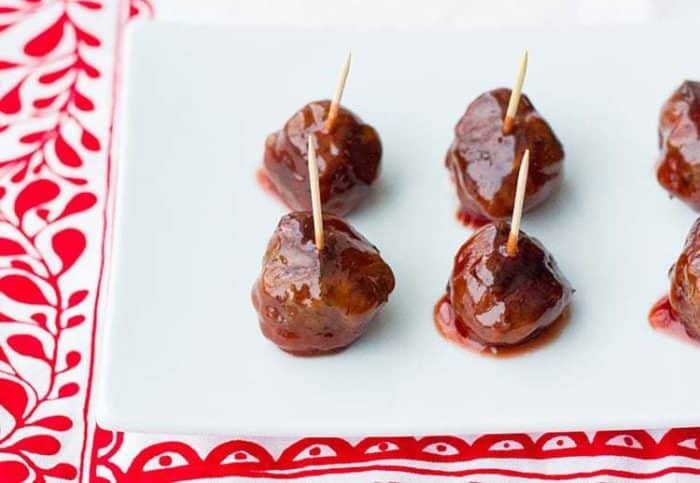 This 3 ingredient recipe for sweet, saucy grape jelly meatballs is always a hit! It's so easy! Put the jelly, ketchup and Worcestershire sauce in a small pot on medium heat. Preheat your oven to 350 °F. If you like it more tangy than sweet you can add a few tablespoons more ketchup.